This is one of those intriguing passages of the Bible that the four Evangelists treat differently. Matthew and Mark do not name the woman and have Jesus’ head anointed in Bethany at the house of Simon the Leper. Luke does not name the woman either, but has the anointing earlier in the ministry of Jesus, at the house of a Pharisee called Simon. 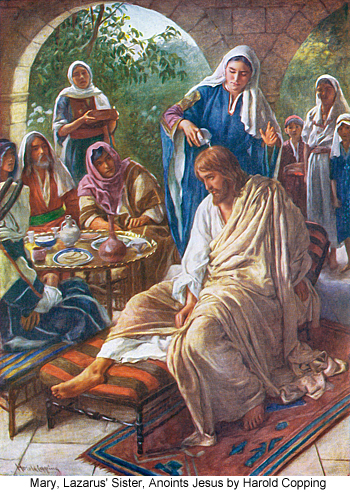 John has the anointing before the Passion at Bethany, as do Matthew and Mark, but has the anointing done by Mary, the sister of Martha and Lazarus, in their home. Luke and John have Jesus’ feet anointed, rather than his head. Some have concluded that there were two, or even three anointings, though I think that it is more likely that these are different versions of the same event. The name of the host in the Synoptic Gospels is the same, and none of the Gospels is really bothered with chronology in the middle part of Jesus’ ministry. Luke could have moved the story away from the Passion in order to make the connection between being forgiven and gratitude, or Matthew, Mark and John could have told a story which happened earlier at the end of Jesus’ ministry because the event leads into one aspect of the Passion, not only that Jesus was being prepared for his burial but Jesus is being anointed as king, and the passion, which is about to happen, would show what the kingship of Jesus meant, a king who does not lord it over his subjects, but dies for them. The world order has been turned on its head.